This look is just simply adorable. The life-saver design is nautical, fun, and yet still traditional. Using the classic colors of red, white, and blue these life-savers are floating leisurely in a backdrop of blue. 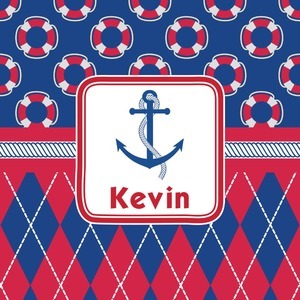 The bottom of the design uses the coordinating colors in an argyle pattern for that timeless element in the pattern. A square label showcases an anchor and rope int the coordinating colors. Add your child's name for that personalized designer's touch.